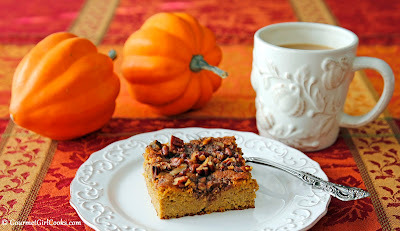 It's throwback Thursday and I'm re-sharing a recipe for Pumpkin Pecan Coffee Cake that I created 2 years ago. It's most definitely a fall favorite of mine. This coffee cake makes a perfect addition to your Thanksgiving breakfast menu. It’s rich, moist and oh so pumpkiny! 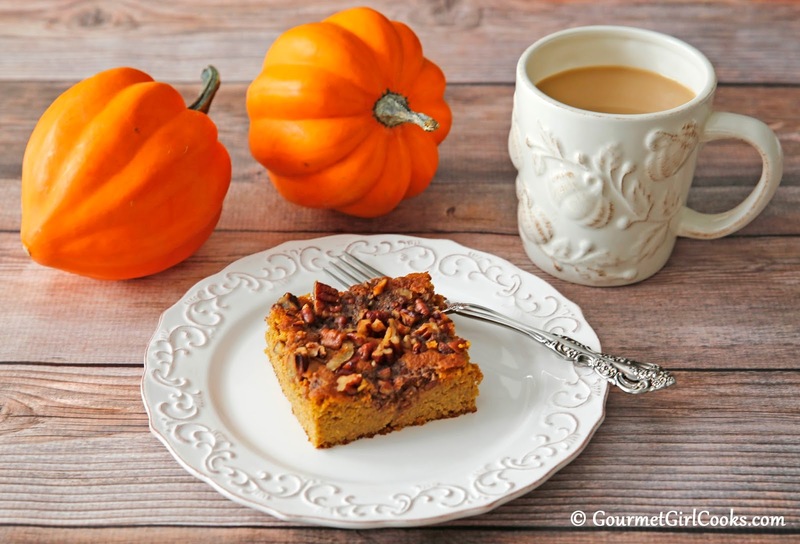 Your house will smell amazing while it’s baking, filling it with the aromas of pumpkin and spice that will waft through your kitchen as its baking. I love this time of year. It's delicious for either breakfast or for dessert. I like adding a dollop of whipped cream or scoop of vanilla ice cream when enjoying it for dessert. 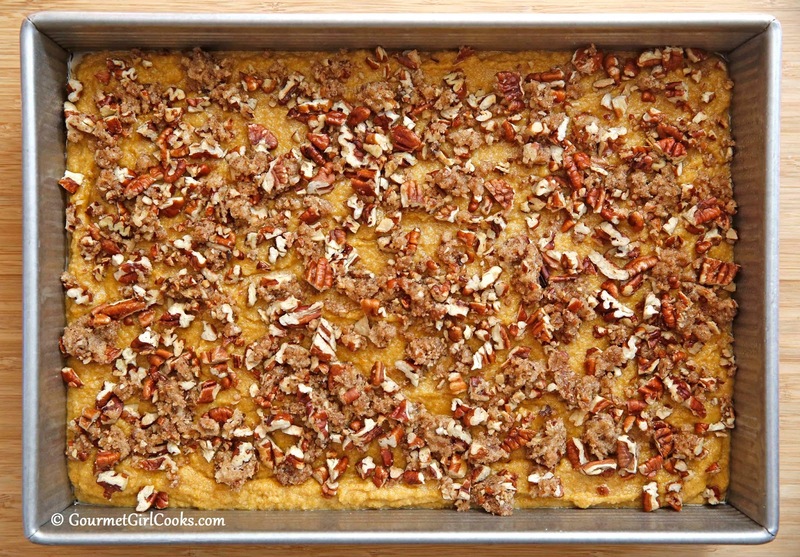 The pecan topping has a touch of molasses mixed into the sweetener to create a brown sugar substitute and is combined with butter and pecans to make a delicious streusel-like topping. It is absolutely amazing with a cup of coffee. 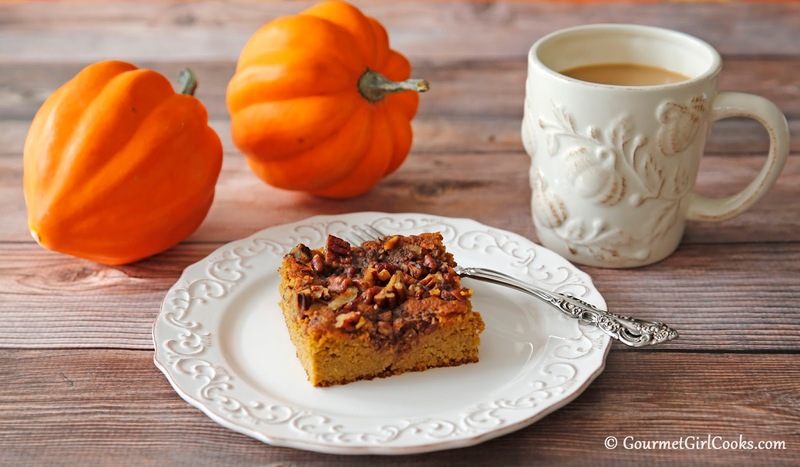 If you love pumpkin and you love coffee cake...this recipe will satisfy both. Try it, you won't be disappointed. I've included some photos and the recipe below. Enjoy! Preheat oven to 350 degrees F. Lightly grease a 9" x 13" baking pan. 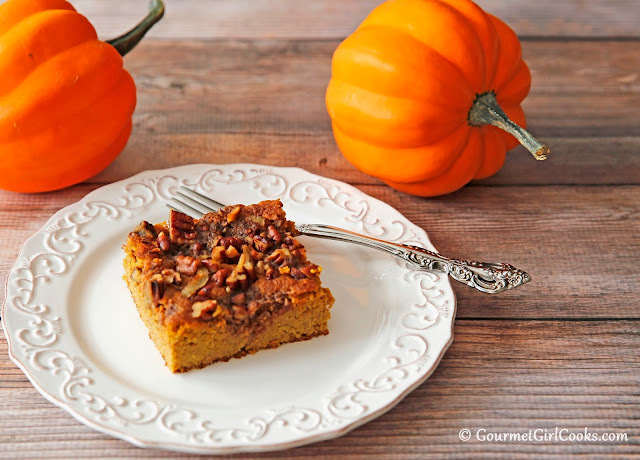 To make the pecan topping, combine sweetener, molasses, cinnamon, and salt in a small bowl; add diced butter and cut in using a pastry cutter/dough blender until mixture is coarse and crumbly (or the mixture can be pulsed until combined and crumbly in a small food processor). Stir in toasted pecans and set aside. To make the batter, whisk almond flour, ground flax, coconut flour, sweetener, salt, baking powder, baking soda, cinnamon and nutmeg in a large bowl until combined. In a separate bowl, beat eggs, vanilla, buttermilk, pumpkin and melted butter together until smooth. Add wet ingredients to dry ingredients and mix together, beating with a rubber spatula or hand mixer until a thick batter is formed. Pour batter into prepared pan and spread evenly with a spatula. 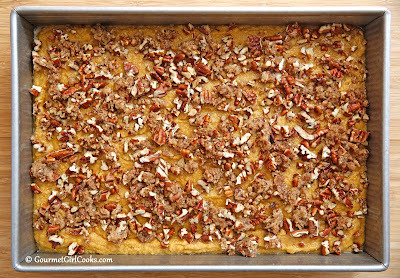 Top with pecan topping and bake for 50 to 55 minutes, or until a toothpick inserted into the center comes out clean. Cool in pan on a wire rack. 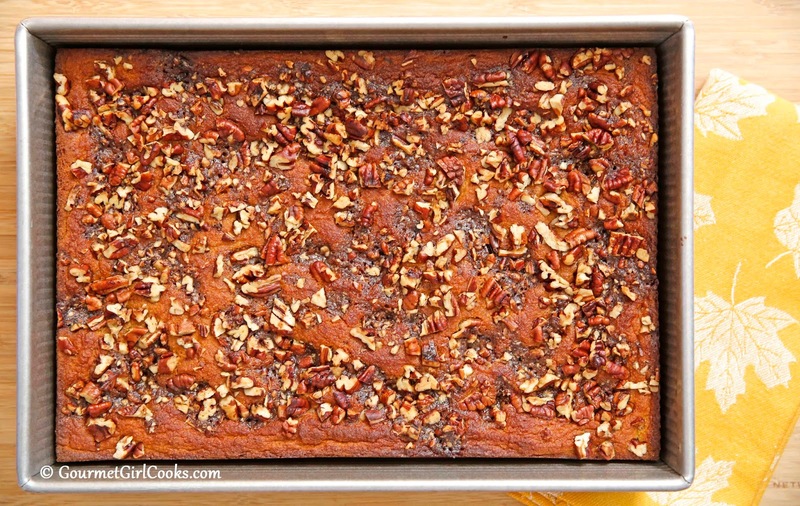 *Note: To toast pecans, spread in single layer on a baking sheet and bake in oven at 350 degree F for approximately 5 to 8 minutes, stirring frequently until lightly toasted. Truly one our our all-time favorites. 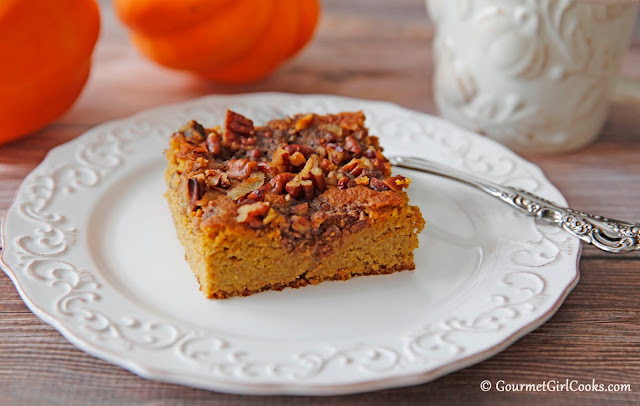 I love being reminded of some of these recipes! The brownie bites a couple of weeks ago and now this one, which I love! I think I will put this one on my list for this weekend - I just happen to have a pie pumpkin sitting on my counter that I will bake and purée ;) Thank you!! Is it OK to omit the ground flax seed? If not what can be used as a substitute? 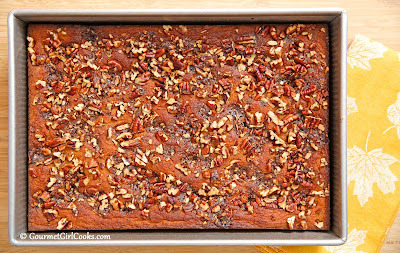 I'll be making this coffee cake for someone who doesn't like flax seed. Thanks! I've used both sour cream and yogurt in baked goods instead of buttermilk. They worked just fine for me. This is delicious! Definitely a keeper recipe!